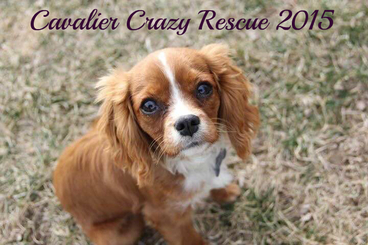 For a great website with official breed standards and breed history check out Your Dog Advisor's page on Cavalier's here! Temperament: Happy, friendly. Aggression, nervousness and shyness are not tolerated in show dogs and dogs with these traits should not be bred. Blenheim-pearly white with chestnut markings. White blaze with even chestnut markings around eyes. “Blenheim spot, Queens thumbprint” on forehead is desirable. Tricolor-pearly white with black markings. White blaze with chestnut “eyebrows”, cheeks, under ears and under tail. Ruby: solid chestnut. No white markings. Black and tan: black with chestnut “eyebrows”, cheeks, under ears, on legs and under tail. No white markings. Faults: heavy ticking (freckles) on the white of blenheims and tricolors. Any white markings on rubies or black and tans. Aggression, shyness, nervousness. Cavalier King Charles Spaniels are wonderful dogs. I have been owned by them for 6 years now and in that time I have owned several and have fostered dozens of cavaliers. Between my rescue, our monthly playgroup and cavalier groups on Facebook I have met dozens of cavalier owners and cavaliers. I get phone calls and emails all the time from people who are interested in adopting or buying a cavalier and want to know more about them. Many times they have read about them online in an article or something and think that they sound perfect! The truth is, I love cavaliers and can’t imagine my life without them, but they are NOT for everyone. This is something I am brutally honest about when talking to people who do not know the breed. Many of the “breed profiles” you read online gush about the many positive qualities of a cavalier; they are loving, friendly, sweet, happy dogs. They are all of those things. But many times the profiles do not mention the not so good along with the good. And there is a lot of not so good! Or at the very least, there are things any potential cavalier owner should know about before buying or adopting. If you are buying a cavalier puppy it is VITAL that you buy from a breeder whose dogs are regularly health tested and certified. They should be able to show you the proof of the health checks and certificates. If you buy from a pet store or a backyard breeder these dogs are most likely not tested and dogs with health problems are regularly bred with no thought to the consequences. Our first cavalier was bought from a backyard breeder back when I knew little about the breed and what I read online didn’t emphasize the importance of testing. He has epilepsy, which has cost us thousands of dollars over the years in tests and medication, not to mention the heartache of watching him have seizures. I can’t emphasize this enough. Make sure the breeder health tests the parents or you are risking spending thousands of dollars on surgeries and treatments if your dog has one of these disorders. They are all genetic. Now that the health issues are out of the way, let’s talk about behavior. Cavaliers are known for their happy, outgoing personalities. They can make fantastic therapy dogs because of their gentle demeanor. BUT…cavaliers are also prone to many behavioral issues which are common to the breed and that many many owners will tell you about. Cavaliers can be big barkers. Be it the dogs next door, the dogs on TV, the doorbell ringing or a particularly interesting leaf blowing by, many cavaliers are prone to barking. Yes, many of the breed profiles say they are quiet. And with proper training they can be, but most of the cavaliers I know are indeed big barkers! This is something that should be addressed when they are young, as it’s hard to untrain a barker. Cavaliers are very food motivated. They are known be food thieves and to go to great lengths to swipe food from their owners tables or even right out of their hands! They are also prone to weight gain and obesity. And obesity is VERY bad for any dog, but especially for dogs like cavaliers that are prone to heart problems. Extra weight on a cavalier means the heart has to work extra hard and even just a slight amount of extra weight can cause a heart murmur, which can be deadly in a cavalier. It’s important to watch your dog’s weight. Do not free feed your cavalier. And use healthy treats like carrots and green beans. Cavaliers are prone to separation anxiety. Cavaliers are, first and foremost, companion animals. They were bred to be “Comfort Spaniels” and were bred to be royal lap dogs. They have not forgotten this! Cavaliers want to be with their people. ALL. THE. TIME. They follow you from room to room, they stand guard outside your bathroom door (if you don’t just let them come in with you!). They sit next to the tub or shower and wait for you. And the instant you sit down…they are in your lap! This is life with a cavalier. If you do not want a furry little shadow, you do not want a cavalier. There are exceptions, of course, but as a whole, this is the common cavalier behavior. They do not want to be alone, and some develop very bad separation anxiety, where they bark and scratch and even become destructive when left alone. Having another cavalier can definitely help this, and most cavaliers do best in pairs. They bond as strongly to their dog companions as they do their human ones, but just because they bond to another dog doesn’t mean they don’t want to be with their people, as some breeds tend to do. Cavaliers are absolutely NOT outdoor dogs (in my opinion NO dog is an outdoor dog). They need human companionship. If you want a dog to leave outside, a cavalier is NOT for you. Cavaliers are adaptable and can be great apartment dogs as long as they get enough exercise. However they tend to be notoriously bad off leash. They are descended from scent hounds and will take off without a second thought, right into the street and in front of a car if they see or smell something they want to investigate. It is important to keep cavaliers on leash unless they are in a secured area. And I cannot emphasize this enough: Cavaliers shed. They shed a LOT! If an ad says they are low shedding-they are not being honest. Any cavalier owner can tell you this. They are heavy shedders! If you want them to have the long, flowing coats of a show dog, you will have hair everywhere and you will need to brush your cavalier a lot to keep them mat free! You can read more about grooming your cavalier in my blog post! Cavaliers are sweet, loving and unfailingly loyal. They tend to get along well with everyone. They also tend to get along well with cats and other household pets. They are smart and eager to please, so tend to train quickly with positive reinforcement training. They are very sensitive and do not react well to harsh training methods. Using such methods can easily break your cavaliers spirit. If you take your cavalier to a trainer who emphasizes dominance training or harsh methods, you should reconsider and try to find a trainer who uses positive reinforcement and gentle training methods. If you are looking to adopt an adult cavalier, some of these behaviors may be deeply ingrained and hard to break. Be sure when you apply for an adult dog to be completely honest about behaviors you can and can’t tolerate so that the rescue can help make a good match for you AND for the dog.